The Echinoblog: Spiny-Skinned "Canaries" in a Coal Mine? 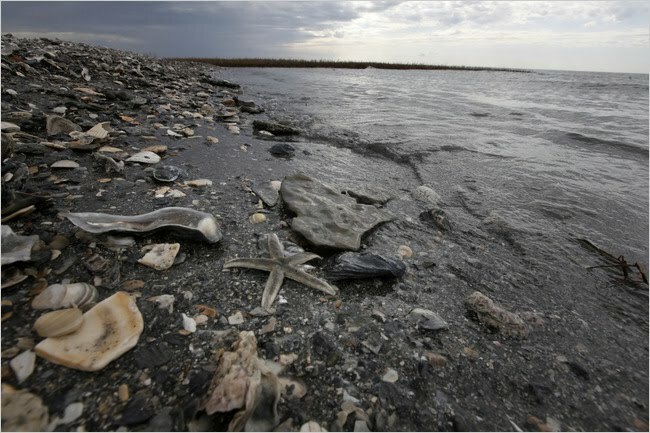 The Gulf Oil Spill & the Impact on Echinoderms! Spiny-Skinned "Canaries" in a Coal Mine? 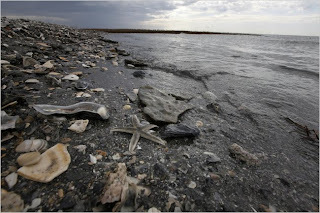 The Gulf Oil Spill & the Impact on Echinoderms! Sadly, much of the ecological and marine biology news over the last week has been dominated by the huge oil spill threatening the Gulf of Mexico. Comprehensive accounts of this event are nicely summarized by my friends over at Deep Sea News here and here. A great deal of the public media coverage will show you heartbreaking images of turtles, seabirds, and other charismatic vertebrates that will be harmed by this ecological catastrophe. But the sad truth is that some of the animals which will be hit worst by the oil spill will probably be invertebrates. A general overview of the effect of oil on marine invertebrate communities can be found here. Echinoderms are exclusively MARINE invertebrates, that is they ONLY live in the ocean (none in freshwater or terrestrial). There are relatively few invertebrate groups that can make that claim. And as such, they are VERY sensitive to environmental changes. Are they the spiny, marine equivalent of the "canary in a coal mine"? So, what kinds of impacts/effects will we see as crude oil spills impact the marine invertebrate communities in the Gulf of Mexico?? 1. Marine Larvae will be Badly Affected. 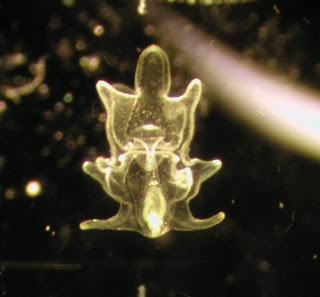 So, many if not most marine invertebrates go through a small free-floating, free-living or swimming larval stage that live in the water column. These larvae then undergo a transformation from the larvae into a juvenile and eventually into an adult. A good photo essay of this can be seen here. So, can happen if you saturate the water with crude oil? A variety of possible effects: 1. Death. 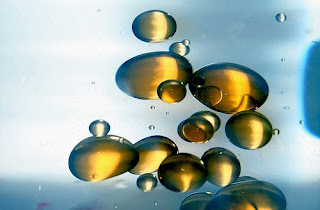 The oil adheres and smothers the larvae which prevents respiration, movement, creates excess weight. Not to mention the toxic effects of other chemical additives. I would imagine that there can be fairly severe larval dieoffs. c. Stunts growth and ability to mature. d. Inability to defend against/avoid predators. 2. Oil Impacts on the ADULT animals.... So that was larvae. Larvae are tiny (about 1mm if even that!) But starfish are BIG!! 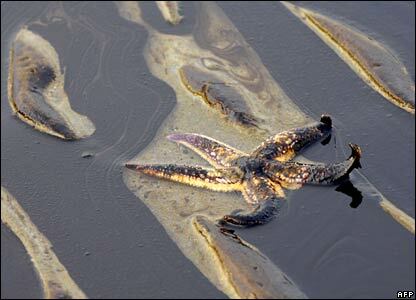 How specifically are adult echinoderms vulnerable to oil spills? Most other animals you might think of....crabs, clams, snails, worms, fish, etc. , they have internal, self-regulating kidneys, livers, and etc. that maintain a certain level of internal body chemistry that is healthy for the animal. Unlike these other animals, echinoderms have bodies that are functionally open to seawater. Effectively echinoderms have HUGE amounts of surface area because water enters from the tube feet, the madreporite and other places throughout the body. 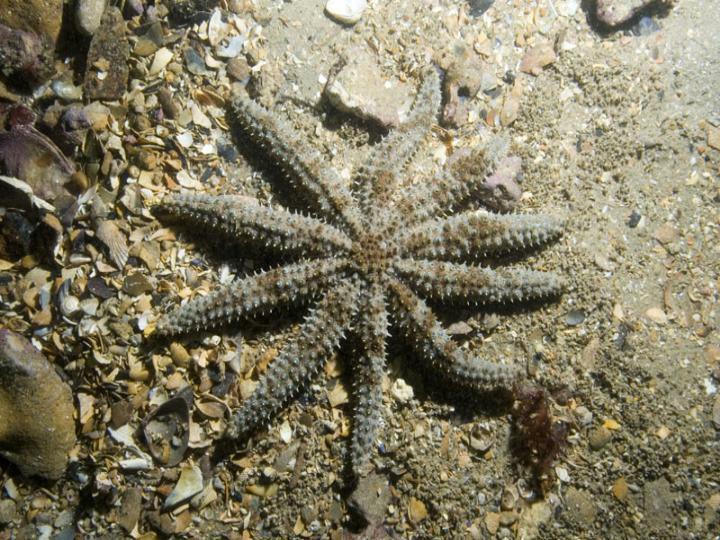 The internal body of echinoderms are essentially in constant contact with their surroundings. Echinoderms constantly pump essentially SEAWATER in and out of their bodies to fuel their water vascular system (i.e., their tube feet and locomotory apparatus). 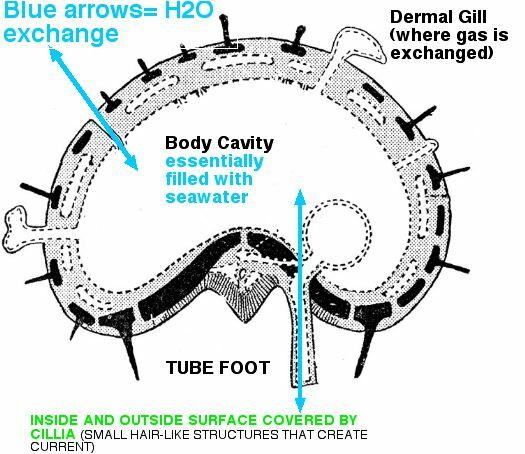 Millions of tiny hair like structures called CILLIA beat and create a current over the surface of the body that drive gas exchange and carry away toxins. 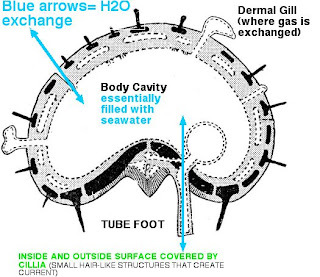 SO, something like crude oil would physically smother and adhere to the cilia and other body surfaces as well as block respiration (gas exchange) on the body surface. 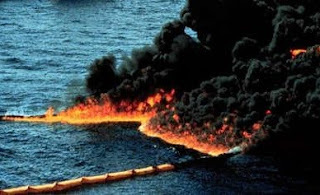 That's not to mention the other toxic effects which the animal would be unable to remove because the oil would be clogging/blocking/interfering with the natural way the animal regulates the removal of foreign substances. Chemical adhesion in tube feet would be blocked by oil and rendered ineffective. This specific dependence on fresh non-toxic seawater has always been part of echinoderms' fundamental biology. They often have great sensitivity of the water around them. Speaking from experience, one doesn't usually see echinoderms where water quality is anything less then optimal. Some have gone so far as to interpret this intrinsic link to seawater as the reason why echinoderms have never exploited freshwater and terrestrial habitats or other settings where regulating toxic substances is crucial. Also, this is POSSIBLY why echinoderms are generally absent from natural settings where toxic chemicals are present, such as hydrothermal vents or cold seeps and is likely why crude oil SO adversely affects echinoderm biology. 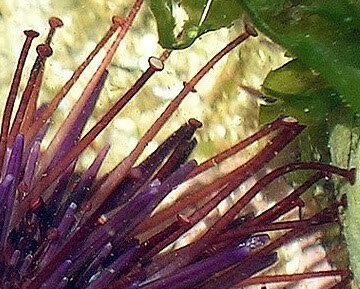 Could Echinoderms Provide Insight as to Some Short-Term Solutions? 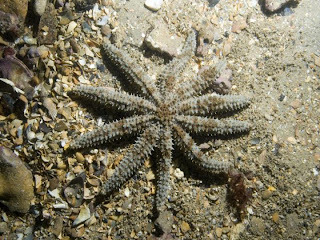 One interesting experiment that exposed oil products to echinoderms was this paper by Georgiades et al., (2003) which studied oil-derived substances and determined their impact on the commonly encountered Australian asteriid starfish Coscinasterias muricata. So, it was pretty clear that oil was going to act as a stressor on these animals..and that's what they saw...the appetite and ability to locate food was affected as well as the stars' ability to right themselves when turned upside down. Crude oil and the dispersed oil resulted in the greatest negative impact. And in fact, dispersive chemicals were actually MORE toxic then crude oil itself.. But bear in mind, this experiment was performed in a lab with isolated oil products. An actual burn would involve, you know..FIRE, smoke and other toxic substances that echinoderms aren't likely to handle well.. 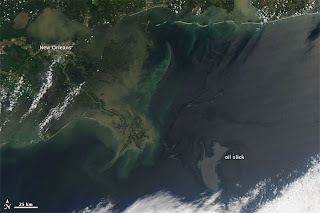 So..in Conclusion.. things don't look good for the great diversity of echinoderms and/or other marine invertebrates in the Gulf given the increasingly growing oil slick problem. Echinoderms might be a little more vulnerable and more different then other marine invertebrates...but they are often regarded as the "model animal" for how certain marine invertebrates will fare.....and based on other studies, its probably not unreasonable to predict a massive die-off of not just echinoderms...but other marine invertebrates. "in-echinomanity" and the bias of inverts faced by an increasingly hostile snail crowd. Yep, that is right. The Molluscans have a voice that, is out of proportion to, their relevence; and that voice is personified in the ramblings of a Dr. Myers. PZ Myers would have you believe that ossicles of the echinoderms are merely food for his squishy hoard. Don't buy into that nonsense-we all know that it is the molluscs that that provide fine dining through out Europe... who ever ate an echinoid? Well, outside Asia. Further food for thought: Why did garlic evolve??? It wasn't for the echinoderms! Battle of the Titans! Starfish Vs. FOOD Videos! !